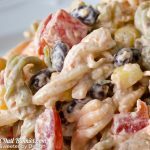 A tasty twist on pasta salad that will have you coming back for more! In a large mixing bowl combine the ingredients of the dressing. I like to use a whisk to make sure everything is well combined. Add all the remaining ingredients and gently combine using a large spoon. Cover with plastic wrap and set in the fridge to chill for at least 30 minutes. Keep in mind that the longer this chills, the better the taste. I like to make this the night before and let it chill overnight.